Avant d'envoyer une demande de réservation, veuillez prendre le temps de lire toute la description afin de nous assurer que nous répondons à vos besoins. Architecture Moderne Casa Brava extra-privé dans Jungle Cadre avec de grandes vues sur l'océan Pacifique! Très Privé! Superbe très grand appartement de studio loft moderne situé dans l'un des emplacements de premier ordre, à distance de marche des restaurants, des boutiques fantastiques, le surf ou tout simplement assis dans les cafés pour regarder les gens. Pourtant, la propriété est juste assez loin et totalement privé à offrir toujours une vue panoramique sur l'océan Pacifique, jungle préservée, et le pittoresque village de Sayulita. Il est oiseau étonnant à regarder de la maison: les petits perroquets verts, les noirs-gorge Magpie Jays, aras et même Chachalacas (si vous ne en voyez un, vous aurez certainement l'entendre); ce sont quelques-unes des 336 espèces vivant dans la zone. Laissez vous aider à organiser pour une observation des baleines incroyable tour de Décembre jusqu'au début Mars. La visite est dirigée par un océanographe de recherche qui suit leurs schémas de migration le long de la côte nord-américaine et connaît le nom de tous les baleine par la vue. Randonnée à travers la jungle pour les plages isolées et pique-nique avant de sauter dans les vagues. La maison a été conçue par un architecte mexicain bien connu dans le vrai style contemporain utilisant des murs entiers de verre avec merveilleuse l'intérieur / l'extérieur de sensation béton et. Chaque détail a été soigneusement choisi individuelle pour compléter et améliorer la conception unique et confortable ... des accents de bois Parota, meubles sur mesure, vue sur l'océan douche pour deux !. Les lits king size disposent 600 fils au pouce draps en coton égyptien, et fait un endroit idéal pour se détendre et regarder l'un des titres de 300 DVD à la médiathèque. Si vous ne pouvez pas quitter complètement le monde extérieur derrière, il ya WIFI dans tout. Le Studio Loft est parfait pour un couple, mais la maison d'hôtes et maison principale peut accueillir six autres pour un total de huit. Le directeur parlant anglais à temps plein répondra à vos questions et vous aidera avec tous vos besoins Nous fournissons également le ménage. Remarque: Bien qu'aucun cas de virus Zika n'ait été signalé dans la région et que vous soyez enceinte ou que vous envisagiez une grossesse, veuillez en parler à votre médecin avant de descendre. Par mesure de précaution, nous vous suggérons de souscrire une assurance voyage. Aussi à savoir, l'appartement n'a pas accès à la piscine ou au téléphone VOiP mais le wifi est très bien pour skype. L'appartement ne ont pas accès à la piscine ou la téléphonie VoIP. 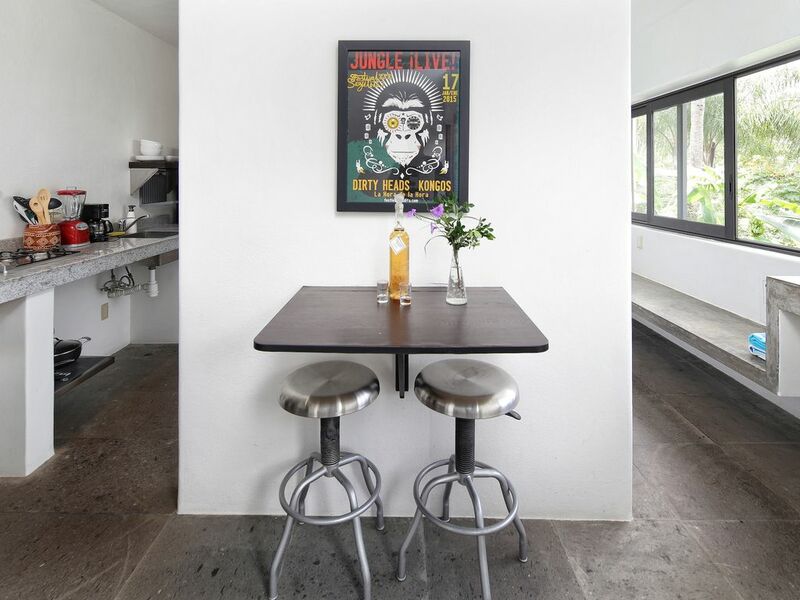 Casa Brava is located in a stunning location, overlooking the town and surf of Sayulita. The accommodations are fantastic and the care taking staff are the friendliest and most hopeful I have ever been exposed to. Thanks, Peter. So glad you enjoyed your stay. Two weeks is the perfect amount of time to get into the groove of things. Looking forward to seeing you again. I would highly recommend Casa Brava as a simple getaway from start to finish. Dale was a wonderful host and from the moment we booked all the way through our departure was checking in with us and making sure we were well prepared for each day! Felipe the caretaker was on site each day to also make sure we were comfortable and were getting the most of the stay. Sayulita is a wonderful town with great restaurants and happy locals and visitors alike buzzing through the streets! Can’t wait to book our next stay at Casa Brava!! Thank you for the kind words. It was a pleasure hosting you and we hope you'll return soon. Casa Brava is a beautiful place with an expansive view. Dale, the owner is very available and accommodating as is the staff upon arrival. The location is not for the faint of heart it you're on foot. It's a very steep walk up to Casa Brava but if you rent a car or golf cart it's not an issue. Personally I welcomed the exercise. One other thing of note: the last two weeks of February is a huge celebration in Sayulita. It's very noisy and especially up in the mountains where the place is located. It's a festive time but not a peaceful one so bear that in mind. Other than that I was thoroughly pleased ! Thank you Dale. Thanks so much for your great review. The Sayulita Days festival is one of our favorite times, especially the dancing horses and carnival rides. Hope to see you again. My boyfriend and I just spent a week at Casa Brava and couldn't have had a better experience. Dale was an outstanding host, always going over and above to ensure our time in Sayulita was as enjoyable as possible. From little details like the welcome bottle of tequila to lending us a cooler bag for the beach, each day we were made to feel like we were part of the Casa Brava family. Felipe, the property manager, and the rest of the house staff were friendly and incredibly helpful. This was honestly one of the best vacations we've ever been on. There isn't a single thing I would change about our stay at Casa Brava or our Sayulita experience. Thank you Dale and Felipe! We hope to be back again soon. Thanks for the great review. You guys were wonderful and you are welcome back anytime! Casa Brava is an amazing property! The owner was easy to work with and always available from the day we thought about booking until we got home. The owners provide a very comprehensive and detailed list covering any questions you may have while on your stay. From where to eat, things to do, how to get around, all the way down to what insects to watch out for is covered. We found this guide very helpful. The couple that looks after the property while you are there were very nice and helpful. We spent a few days in the loft portion of Casa Brava as well as a couple of days in the main house. The loft was perfect for us, we would stay there again in a heart beat! The views are amazing. It is the perfect size for a couple looking to spend some time together for a while. The main house is breathtaking, words and pictures don't do it justice. The decor, views, pool, bedrooms and dining areas are all spectacular. The only downside to the main house is that it is so nice that you will find it hard to leave to go do other things that you may have arranged. It's a large space that would be perfect for two couples. The property is only a ten minute walk to the main area of town and the beaches. It is up a steap hill but the views make it worth every step. We always did the walk but don't let the hill deter you, golf carts and taxis are an easy way around this if that might be a problem for you. We liked that it was an easy walk to all the action but far enough away so the noises of everything wouldn't drown out the sound of the ocean and jungle. Can't say enough good things about Casa Brava, we are already checking the calendar for the next time we can make it back. Chelsea, we love it when folks enjoy our home as much as we do. Please come back and visit soon. Ask about last minute rates. Includes all taxes, housekeeping, WIFI, plus unlimited fun! Does not include the customary gratuity for the house staff. Also check out our other properties for larger groups, listing 112927 and listing 74593 to accommodate 2-8 guests.